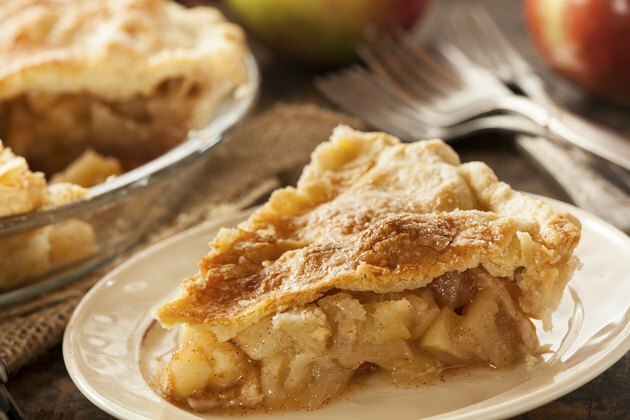 Particularly during the winter months, apple pie is an all-American delicacy. The warm pie served with a scoop of vanilla ice cream sometimes hits the spot. As a sweet, high-calorie dessert, portion control is key when eating apple pie. An appropriate serving size is one-eighth of a pie with a 9-inch diameter or one-sixth of an 8-inch-diameter pie. One slice contains between 277 and 296 calories, depending on the size of the pie. A total of 57 percent of the calories come from carbohydrates, 42 percent from fat and 3 percent from protein. You'll also consume 18 to 20 grams of sugar in a single piece. Eating excessive amounts of calories can lead to obesity and chronic diseases. So try to save apple pie for special occasions to help promote a healthy waistline. How Long Does It Take to Go Down 5 Pant Sizes When Losing Weight?